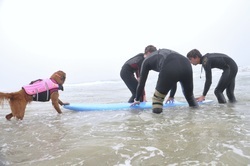 Your Surf Dogs first introduction to the surfboard and water should be on a lake, bay or swimming pool. Some place where the water is calm. First, put on their CFD and wade into the water about knee deep. If they don’t just jump up onto the board, (this would be awesome) then use your ‘UP’ command. Remember, lots of enthusiastic praise! When you get them up, position them in the correct spot and just push them around! If you have a large enough surfboard or a Stand Up Paddle Board, you can paddle your dog around in the calm water on a lake or in a bay or lagoon. This is a great way to get them use to the motion and balance that will be so important later. Paddling your Surf Dog around on a Surfboard, Paddle Board, Kayak or small boat is great way to introduce your Surf Dog to all the sensations they will soon be experiencing. Try to keep your dog between your legs or behind you. If your dog gets used to being on the front of the paddle board, this will be a big problem when it comes time to surf! When you think you’ve had enough, why not swim a little with your Surf Dog? It’s great exercise for both of you and a great way to bond & build trust! After all, you will both be swimming a lot in the Ocean! There are several ways to get your dog up onto the surfboard. Some are related directly to the size of your dog. What ever method you use, find out what works for you and do the same thing every time. More on why you want to do the same thing every time later in Chapter 8, ‘Going Out’. This works well with small dogs, as shin deep water for you is like overhead for them. You will need to carry the surfboard under one arm and carry your Surf Dog in the other. Do Not carry them by the handle of the CFD! The handle is just for emergencies! Hold them in your arm with your hand under their chest, keeping them close to your chest. This will make them feel safe and secure. This will be very important later when you are heading out into the surf. Don’t forget the praise and enthusiasm! You stand to one side and towards the back of the surfboard with the nose of the surfboard facing away from your Surf Dog. Hold and steady the surfboard with one hand. Your Surf Dog walks up and places their front two paws on the surfboard. With your free hand, place your arm under the dog’s stomach and gently lift them up onto the board. During this time don’t forget to use the ‘UP’ command. I always stand on the back, left side of the surfboard holding the board with my left hand. I use my right hand (I’m right handed and my right arm is stronger) to lift my 85 pound dog. You might do the opposite and stand on the right side. Find what works for you and do the same thing every time. More on why you stand to one side or the other later in chapter 8 ‘Going Out’. Ricochet shows us how it's done. Position yourself in front of the surfboard with the surfboard between you and your Surf Dog. Holding the nose (front) of the surfboard, you lift the nose slightly and dip the tail (back of the surfboard). 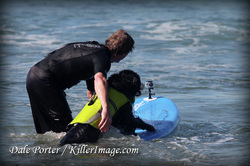 The idea is that your Surf Dog will walk or run right up the back of the board. This works great when you’re in shin or knee deep water. Dogs who really like to surf, love to get on their surfboards this way. If you use this technique, only do it quickly to get your Surf Dog on the board, then immediately turn around and reposition yourself on one side or the other, in the back 1/3 of the surfboard to head out into the surf. After your Surf Dog is on the surfboard, we do not recommend going out into the surf backwards. More on this in Chapter 8, Going Out. Getting your Surf Dog back on the surfboard in deep water is a little trickier. Depending on the weight or you Surf Dog, a little strength may be required. There are a couple of ways you can try to see what works for you. Dip Retrieve your surfboard. Placing your arm over the surfboard, push the tail of the board down so your Surf Dog can swim up to and on to the board. They may need a little assistance. Place you hand or arm under their stomach and gentle help them up. Two Paws Up Retrieve your surfboard. Hold the surfboard steady with one hand. 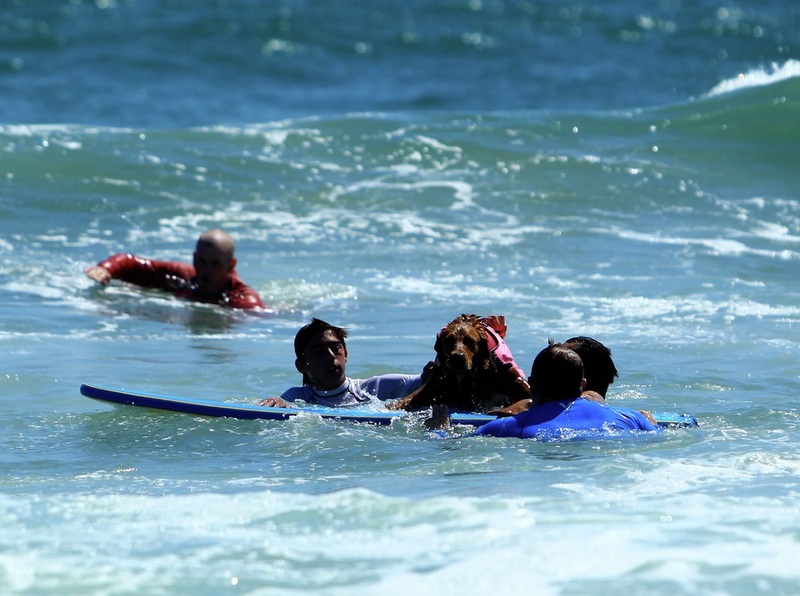 As your Surf Dog swims up, they will place their front two paws on the board. Place you hand or arm under their stomach and gently help them up. This is more difficult than it sounds but is worth practicing!